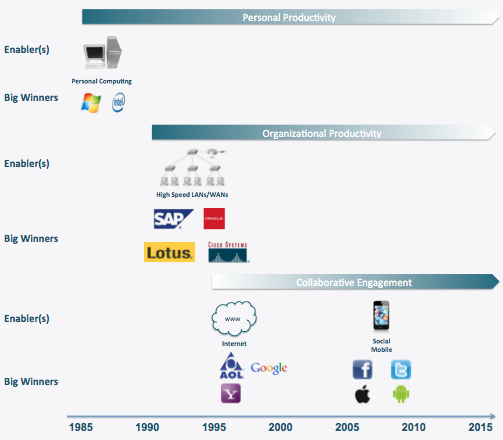 Era of Collaborative Engagement (changed from the Era of Consumer Engagement). Mobile and social have shifted the focus away from one-way communication, and towards collaboration. The impact of this shift is felt not just when engaging with consumers, but also when engaging with employees, business partners, suppliers and investors. Lotus Notes (added to the era of Organizational Productivity): Notes software truly was the first step in the direction of intra-enterprise collaboration, well before the era of collaborative engagement commenced. Over the past 3 decades business related information technology has experienced three key era's of growth. While the first two era's are somewhat related, in that they both focused on productivity gains, the third era is clearly a bit different. Focus on B2C vs. B2B: Social and mobile have an impact on both B2B and B2C, however the greater impact is on how organizations engage with external constituents (i.e., customers or citizens) vs. internal constituents (i.e., partners or employees). Lean startup in the enterprise: Build. Measure. Learn. When you are building a product for the consumer, its best to build lean and iterate vs. to build bulky and pray. Centrality of UX: If you cannot impress a consumer in the first 30-60 seconds of interaction with a new mobile app, then you might have lost them forever. In this new world, UX is king. Decentralized creativity: Ideas for new and interesting products and services, and suggestions for improvement, can come from internal or external constituents, not just top level management. Driving top line growth: The primary focus of enhancing personal or organization productivity is cost minimization. While effective customer engagement can no doubt reduce cost, its biggest pull lies in driving new revenue.